What is the impact on the score/grade issued. The Food Hygiene Rating Scheme (FHRS) provides an indication of the standards of food hygiene in food businesses providing food directly to consumers such as restaurants, pubs, café, takeaways, hotels as well as supermarkets and other food shops. It takes the results of official food hygiene inspections and the resultant score forms the basis for the hygiene stars. This star rating can be accessed by any potential customers in minutes from the Food Standards Agency Website. Inspectors work to the guidelines of the food safety code of practice when conducting hygiene inspections. 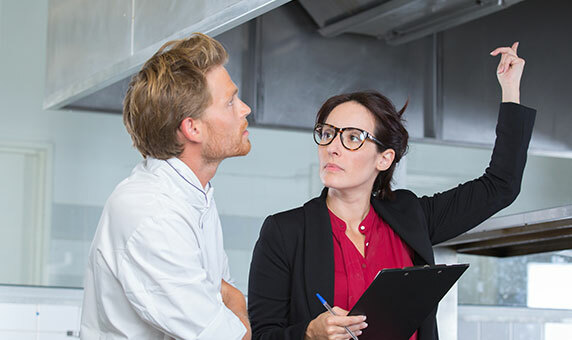 They’ll want to know that your premises (and prep kitchen if you have one) is suitable for hygienic food production. They’ll consider your foods, the way that you work and your FSMS (food safety management system). Your inspection will result in a food hygiene rating (scored out of 5) which will appear on the FHRS website. If an EHO deems your food handling policies and procedures to be poor you’ll likely receive a low score and you might be required to make amendments before you can continue to trade. How the grade is calculated is covered later on. A: Type of food and method of handling. 40 Manufacturers of high-risk food, wholesalers and packers who re-wrap or re-pack high-risk foods. In this context, high-risk foods may be regarded as foods which support the growth of micro-organisms, and are ready to eat without further treatment that would destroy pathogenic microorganisms or their toxins. 5 Retail handling of foods other than high-risk, and other ambient shelf stable products. Any other businesses not included in the categories above.